On Jan 15, 2013, at 7:33 AM, Regina Cooper of Industry Magazine wrote:“I’ve always believed that art should appeal to its audience—making them think, feel and wonder. Therefore, to me art is always a meaningful experience,” says Diana Sorkin, Principal Artist and Owner of Diana’s Murals and More. 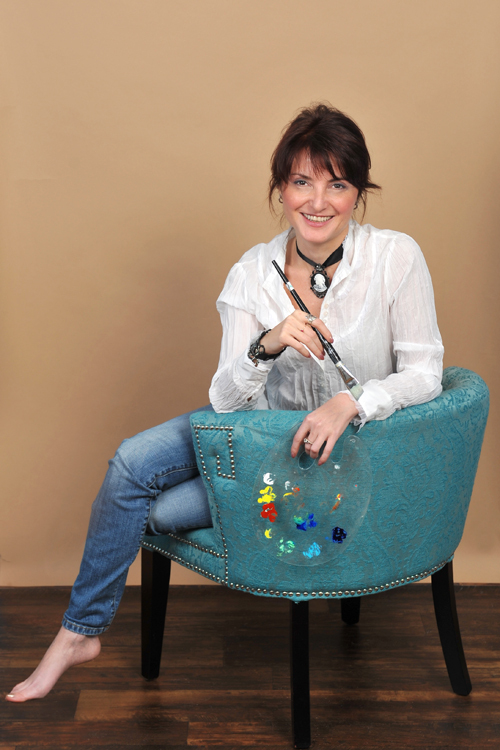 Sorkin, who originally hails from Moscow, Russia, embarked on her career as a mural artist at the age of 16. Her first commission was for a holiday mural, which featured 38 life-size figures. It adorned a wall of a school in Brooklyn. “That’s when I fell in love with the medium,” reveals Sorkin, whose passion and talent has since then blossomed into a successful business creating custom design murals, sculptures and decorative finishes for both commercial and residential clients throughout New York City.The versatile artist, who works in many mediums including everything from watercolors and acrylics to metal, received a classical art education while she was in Russia. Upon arriving in the United States in 1983, Sorkin continued her art education Pratt Institute, where she thrived on the richness of global art and architecture. While there she studied graphic design and communication design. Upon graduation, the artist spent some of her early career designing graphics for fortune 500 companies. “I’ve turned to painting murals because it’s a creative, rewarding and liberating experience,” says Sorkin. “It allows me to create fantasy. I can tell a story, change the mood of a room or use different techniques and optical effects such as trompe l’oeil. Sorkin’s sense of proportion and color enables her to design both commercial and residential spaces. Some commercial projects include trendy restaurants BESO and Bayou, as well as Relax on Cloud 9 spa, the United States Coast Guard and the Stanford White landmark, which was built in 1892. “This was a fascinating experience because it marked my first opportunity with a big architectural project,” says Sorkin. Although Sorkin has created a diverse range of murals for various clients, her greatest passion is creating murals for children. She often creates whimsical themes for nurseries and playrooms. “I always add special touches and hidden details to bring the murals to life and spark imaginations,” reveals Sorkin, whose work includes lots of motion. Her award winning projects include a range of chic restaurants, serene spas, community centers and schools to private residences, child care facilities and office spaces. Among Sorkin’s achievements was being named winner of the Hudson-Shatz poster contest and Channel 13’s Statue of Liberty contest. Sorkin also received the Saint Gaudens award and one of her sculptures was cast in bronze and placed at The Cathedral Church of Saint John the Divine in New York City. Sorkin’s work is priced affordable and begins at $500 and goes up from there depending on the size and detail of the project. She also offers innovative decorative finishes for homes.